Photovoltaic (PV) systems are solar energy systems that produce electricity directly from sunlight and are a reliable energy source. From the abundance of sunlight we receive in New Mexico comes a clean and secure power supply! A solar electric system is composed of just a few major components - photovoltaic (PV) modules which generate electricity when the sun is shining and an inverter which takes the power in from the solar array and turns it into grid quality power which can be used in your home or business or sent back onto the utility grid for consumption by others. If critical loads need power during a utility power outage, or power is needed for remote areas, battery based systems are also available. There are so many reasons to go Solar! Hedge against utility rate hikes. Obtain tax credits, rebates and REC payments. Increase the value of your property without increasing your tax liability. Generate your own clean green power. Reduce your personal or business carbon footprint. Reduce dependence on oil imports. Enjoy reliable energy - PV systems have no moving parts, 40 year design life and 25 year warranty. Affordable - much lower cost than ever available before now, plus 30% federal tax incentive! Good investment - with a short payback time and guaranteed long system life, this is an investment that has returns in more ways than economics. Solar systems are also a "Pre-tax" investment. The ROI from a solar investment is non-taxable as it is money saved, not money earned! When compared to conventional investment instruments, this can be up to a 30% difference in earnings! Sales tax exempt - In New Mexico, solar system equipment and installation cost enjoys tax-exempt status which amounts to another 6% to 8% or more savings when compared to other purchases or investments. 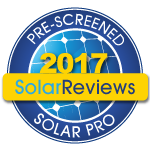 Solar Electric Systems from Select Solar LLC can provide all of this and more, an excellent investment that is designed and installed by professionals. Contact Us for more information. 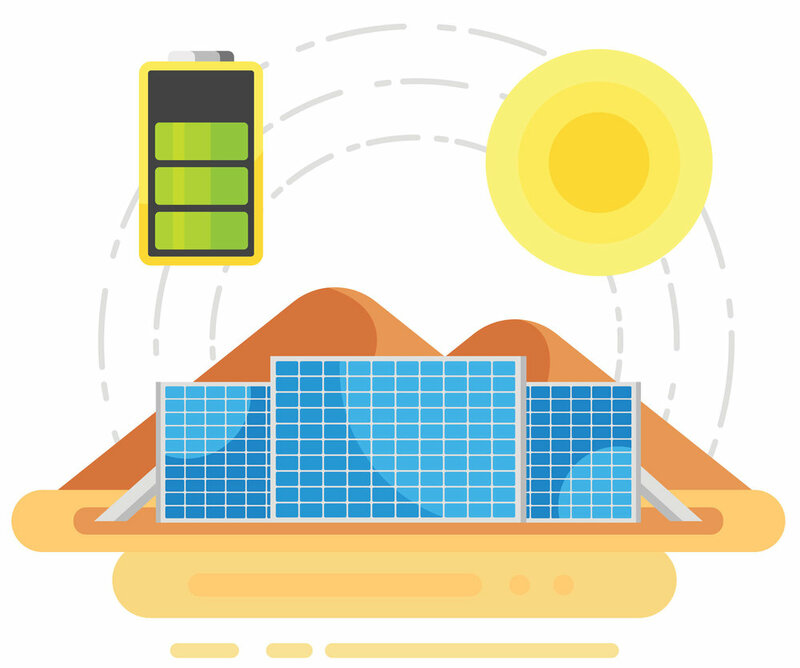 With a grid-tied solar electric system for your residential or commercial building, your system is connected to the local utility grid which serves as energy storage and backup power for the solar power you generate. It is becoming more important for our energy sources to be from technologies that can create sustainable economic opportunities, provide personal and national security, enable workforce expansion and provide abundant energy for a cleaner tomorrow. When the sun is shining the solar electric system will provide energy for your electrical loads. When the sun is not shining, the utility company will provide energy for your electrical loads. When the sun is shining and you are using less power than generated by the solar array, the extra power will be sent to the utility grid. When the sun is shining and you are using more power than the solar array can produce, you will be using all of the solar power and the utility company will provide power for the difference. Reliable - PV modules have proven their reliability in the harshest conditions. Many modules from the 1960's and 70's are still producing electricity today. PV is used for critical power supply backup where continuous operation is imperative. Durable - Modules are guaranteed from the factory to produce power for 25 years and most likely will continue for many more years after that. This long term durability is key to low maintenance costs when compared to conventional power systems. With no moving parts, the maintenance is reduced to periodic cleaning and inspection. Security - Many major solar manufacturers are sourcing materials and assembling products here in the US. In a slow economic time for most business, the solar industry is experiencing massive expansion into major energy markets and providing thousands of new technology jobs. With our energy being produced on site, oil imports can be minimized. Affordable - With the growth of the solar PV industry and ability of manufacturers to streamline their processes, the cost of solar powered electricity is now competitive with conventional energy sources. Massive new solar plants in California won their contracts for 2011 because they were less expensive than the bids from new natural gas power plant builders. A recent study from a professor at Duke University found that solar PV power plants were also less expensive than building new nuclear power plants. The average installed cost per watt for Residential and small Commercial systems has lowered from $10.00/watt in 2006, to $6.00/watt in 2011 and now to $4.00/watt and less in 2017 and even less for larger systems. Also, as a pre-tax investment, solar systems have up to a 30% advantage when compared to conventional investments that are taxed when there are gains. Lock in your electricity rates - Utility rates for electricity will continue their inexorable rise with jumps of 10% and more at single adjustments and a 5% annual average rise in cost. Solar electric systems can provide a fixed cost investment for your energy needs, ensuring that your electric energy cost is not going to rise with the tide.